We’re chugging right along with this pregnancy! Now that I’m out of the rough part, it seems to be going much quicker (imagine that). I absolutely love this part of pregnancy – everything kind of becomes fun all of a sudden. 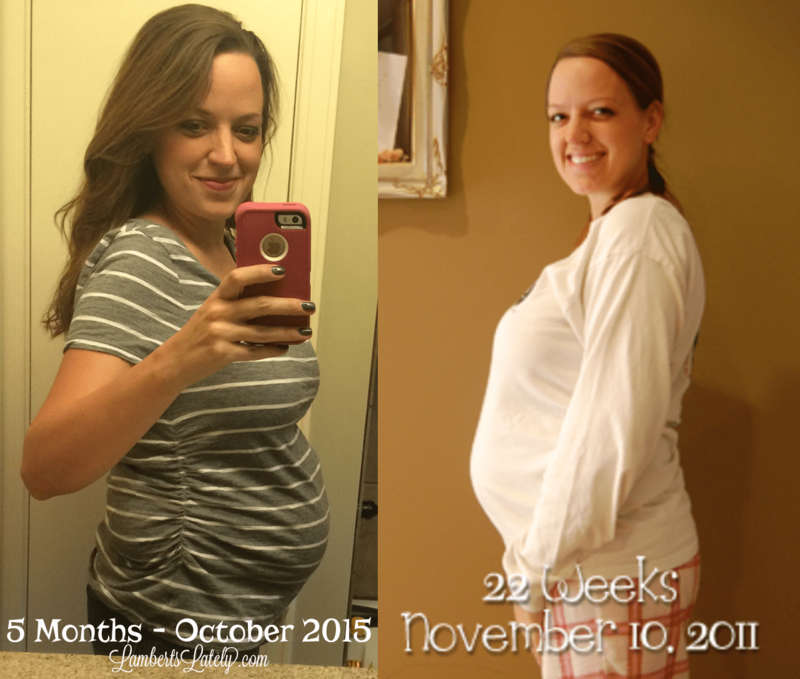 The second trimester is, by far, my favorite part! Here’s what’s going on at (roughly) 5 months pregnant. Size of Baby: Little man is about 11 inches and around a pound, or the size of a spaghetti squash. I predict he’s a little bit bigger than that now though…he was about 13 ounces at the gender ultrasound, so surely he’s gained more than a few ounces in the past 3 weeks. Total Weight Gain/Loss: Gaining, slowly but surely! I am up about 10 pounds from pre-pregnancy right now, which is right above where my weight gain was at this point with Emmie. I think it’s all belly…the rest of my body doesn’t really seem much bigger. Gender: It’s a boy!! I don’t know if I’ve “officially” announced his name on the blog – but little man will be Jackson Lee Lambert. 🙂 We’ve had that name for years (I’m pretty sure Noah had that name before we ever started dating), and I’m sure I’ve talked about that as our boy name before on the blog…but now it’s officially official! Movement: Lots and lots! It seems like he is much more active than Emmie was at this point. Noah felt him kick a few weeks ago, and we’ve had a lot of fun watching my belly move at night. He seems to be really active in the mornings (right after I have my coffee…go figure) and when I lay down at night. Sleep: Really not bad. I have no trouble going to sleep around 11 each night and sleeping until 7-8 the next morning (unlike Emmie’s pregnancy, when I could not sleep past 6am to save my life). The weird pregnancy dreams have started though. I can’t ever remember them when I wake up, but there are lots of random, weird things I dream about each night. What I miss: Not much right now! I still want that turkey sandwich and a spicy tuna roll. Cravings: Just a lot of food at this point! No weird cravings though. I’ve loved carbs (they are an absolute must at each meal), and any kind of carbonated drinks. Symptoms: Thank the sweet Lord my morning sickness is GONE!!! I still have a few minutes each morning where I’m a little queasy, but nothing major at all. It is so nice to be able to eat and function again! Besides that, a little bit of back pain, some of the anxiety I talked about last month (much better though), some Braxton-Hicks. Really nothing major going on right now! Best Moment This Month: Finding out that little man is, in fact, a little man! We’ve also loved feeling/seeing those kicks and starting to buy boy clothes. It’s really been a fun month!